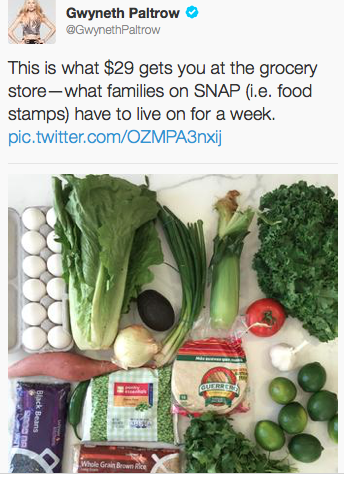 Recently Gwyneth Paltrow tweeted a picture of $29 worth of food to equate to what a family on SNAP benefits has for a week with on food stamps. She isn’t the first celebrity to do this, we’ve even seen politicians do this to make a point to fight against cutting SNAP benefits. While they may mean well, they may think that they are helping, the end result is about the same as them not speaking or doing anything at all. SNAP challenges are in many ways a form of problematic mockery that reduce complicated interconnected issues into single isolated problems that appear to have not too difficult fixes. Attempting to mimic this one component of the very unfortunate inequitable lives of poor people in the U.S. is not solidarity. In many ways intersectionally privileged people engaging in SNAP challenges comes off as some fad, especially when real help & solutions are possible. What Gwyneth Paltrow’s SNAP challenge reveals is that she really is clueless about the intersections of poverty. If Gwyneth wants to help then that’s great, she needs to find an effective way to help that isn’t just donating to food banks which usually provide high calorie low nutrient produce & doesn’t solve the issue of poverty. Food banks do not help combat the ultimate causal factors of poverty, so its influence is minimal & doesn’t combat the host of health problems that come along with poverty. We don’t need band aid solutions & to be honest here, we don’t need band aid solutions from people with enough influence & power to actually HELP. Poor people aren’t just here for you to have pity on so you can feel better about your sense of morality. If you value these human lives then help in was that can alter the balance of power like: a living wage; shifts in workplace control; universal, affordable, quality child care; safe and affordable housing; equitable access to quality education; and universal prevention focused health care, etc..
On the surface, Gwyneth was not saying that any of what I stated isn’t true but she only fake helped. She left out loads of key information that brings attention to the true problems of living in poverty in the U.S.. If she wants to actually help, she can. There are so many other ways in which she and other privileged people like her can do to actually contribute to combating poverty in the U.S. (which also means combating capitalism). The reality is SNAP challenges allow privileged people to engage in what one small segement of poverty is like for a week with NONE OF THE ACTUAL RISKS. Gwyneth also made the mistake of not drawing attention to the reality of what its like to shop when poor & on SNAP benefits, they can’t afford to eat healthy. Rich people who do SNAP challenges don’t have to deal with the overlaying, connected, & intersecting factors of poverty & the consequences of deteriorating health that comes with it. So the processed foods they have to constantly eat coupled with the stresses of poverty puts them at higher risk for a wide variety of chronic illnesses. The stress of poverty alone can kill. SNAP challenges are a very problematic form of mockery. If you want to AMPLIFY the voices of poor people on SNAP then use your economic & racial privilege to go into these poor neighborhoods & interview these poor people, follow them for a day, see what its like, & then make that video freely available. Another issue is that SNAP challenges ignores is how ridiculously difficult it is for poor people to get SNAP benefits. For instance, if you’re working poor and have a family, when are you supposed to have the time to make it to a downtown social services office when you work during their open hours? Not to mention the fact that many people who make more than the federal poverty threshold are STILL POOR but don’t qualify for SNAP benefits. These individuals have to practically make due with tiny food budgets & make food stretch paycheck to paycheck, month to month. Food insecurity is not limited to SNAP benefits, poverty is not limited to the federal poverty line. The federal poverty threshold & federal poverty lines do NOT match the different cost of living in U.S. cities. For example, the cost of living in Buffalo, NY is about 36,000 USD, the cost of living in NYC is about 56,000 USD BUT the federal poverty line is around 28000 USD. The minimum wage in NYS is “going up” to $8.75 but that hourly wage, 48 weeks out of the 52 a year (making wiggle room for life circumstances like ill health & family & holidays) equates to 16,800 USD before taxes. This is what people expect people to be able to survive & provide for their families with. & unfortunately a $15 minimum wage would only provide 28,800 USD before taxes, it also falls short of the cost of living in Buffalo, NY (4th poorest city in U.S.) & in NYC. As an academic I’ve done research on the impact of poverty, racial residential segregation, & food deserts on the dental health of poor Black people in the city of Buffalo, New York. The dental health of a population is a great measure of its quality of life, my research showed that my sample had in some cases 2-5xs the dental disease prevalence of the national average in comparison to the NIH’s Craniofacial & Dental data. As an activist, I’ve used my academic research to bring attention to ways in which local organizations can actually attempt to fix these issues by providing access to resources & pointing out how some of the traditional “interventions” aren’t working. Buffalo, New York is the 4th poorest, 5th most racially segregated city in the U.S.. My research in Buffalo, NY found that in 2013 the 14215 zip code had 1 grocery store, 1 Family Dollar, 1 Dollar General, & 18 bodegas (corner stores). Food insecurity; as a symptom of poverty, involves factors such as income, mobility, residential segregation, neighborhood deprivation, space, place, sociopolitical processes, political economy, time, as well as factors of socio-economic status. Gwyneth’s SNAP challenge didn’t highlight these issues. SNAP Challenges do not bring attention to complex and intersecting problems that poverty in the U.S. is composed of. Food is politics by other means. The issue is that poor people, especially poor Black people don’t have access to affordable & good quality produce. Why? All of the food resources are available in predominately white middle class neighborhoods. According to Bower et al. (2014), “Studies find positive associations between healthy food availability in neighborhoods and the intake of those foods by residents. Large supermarkets have been shown to stock more healthy foods at lower cost. Grocery and convenience stores are found to stock more energy dense, processed, high-fat, sugary, and salty foods.” In a research study conducted by Morland and colleagues (2002), they found that there were four times more supermarkets located in white neighborhoods compared to Black neighborhoods. “Without access to supermarkets, which offer a wide variety of foods at lower prices, poor and minority communities may not have equal access to the variety of healthy food choices available to nonminority and wealthy communities” (Morland and Filomena 2002:23). Research conducted by Morland and Filomena (2007) found that predominately Black neighborhoods in Brooklyn, New York had no supermarkets, demonstrating that the availability and variety of fresh produce is associated with neighborhood racial composition. Bower et al. state that food deserts in urban areas are a possible result of racial residential segregation but the data states that it definitely is. Food deserts in urban areas are in predominately Black and Latino neighborhoods (Morland and Filomena 2007; Morland et al. 2002). Not many scholars have conducted intersectional work investigating the correlations of food deserts, racial residential segregation, and health inequities. When we are looking at the geopolitics of food, health (morbidity and mortality), and segregation, we are looking phenomena mediated by the same power structures. People tend to make food choices based on what is available in their immediate neighborhood. Within segregated inner cities, many individuals rely on high calorie, low nutrient processed foods as quick convenient meals on a regular basis. These types of foods cause malnutrition through providing too many empty calories (over-nutrition) and too little nutrients (under-nutrition). A useful definition of a food desert is supplied by Steven Cummins and Sally Macintyre (2002:436); “poor urban areas where residents cannot buy affordable, healthy food”. Defining a region as a “food desert” highlights social as well as spatial inequalities. People tend to make food choices based on what is available in their immediate neighborhood. Food deserts involve factors such as income, mobility, residential segregation, neighborhood deprivation, race, space, place, sociopolitical processes, political economy, as well as factors of socio-economic status. Working poor Black people in the United States lack political clout, authority, and power structures do not deem this population deserving of good quality infrastructure and resources. Poor whites tend to live in middle class neighborhoods while middle class Blacks tend to live in high-poverty neighborhoods in the United States (Lipsitz 2011). As pointed out by Dill and Zambrana (2006:11), “…race, ethnicity, and geography matter; they are all determinants of access to social capital or social resources”. When the residents of predominately Black and poor neighborhoods begin to get sick as a consequence of racial and economic residential segregation coupled with food deserts and chronic disinvestment, their own plight is used as justification for why they are not worthy of assistance. Their health disparities and economic inequities are seen as the consequences of their own incompetence. The disinvested poor Black neighborhoods do not warrant any importance till socially, politically, and economically valued groups move into their neighborhoods to displace them. This is a vicious cycle that is continued until predominately Black neighborhoods become targeted for gentrification. Health is politics by other means and food “gets at the heart of the amaranthine question of ‘difference’ under capitalism” (Slocum and Saldanha 2013:1). The differential allocation of food is a consequence of inequality under intersectional hegemony. Food choice, for those who aren’t part of the affluent club that the majority of supermarkets target is not much of a ‘choice’. Food deserts and the over saturation of better quality and more affordable produce in spaces where white bodies are located is a differential distribution of resources across physical space. White lives are the types of lives that are valued according to the logic of white supremacist racism. Research has shown that predominately Black neighborhoods are more likely to be food deserts (Block and Kouba 2006; Lipsitz 2011; Bower et al. 2014). In a U.S. Department of Agriculture study, researchers found that poor inner city residents pay four percent more for food than suburban residents (Lipsitz 2011:7).